Series MGP is designed for high side load applications found in material handling, lifting and stopping. The cylinder utilizes an ultra-compact design by incorporating the cylinder body as part of the guide body. As the stroke length increases, so does the bearing length, thus enhancing the cylinder's load bearing capacity. Order made options for this series include adjustable air cushions, heavy duty guide rods, copper free, high temperature, and low speed. The MGPM is a compact body actuator integrated with internal guide shafts to isolate the load bearing from the movement of the actuator's rod and seals. The carbon steel alloy slide bearing provides lateral stability protecting it from side load impacts, suitable for stopping applications. The MGPL is a compact body actuator integrated with internal guide shafts to isolate the load bearing from the movement of the actuator's rod and seals. The high precision ball bushing allows for smooth operation that ensures stable travel resistance, suitable for pushing and lifting applications. The MGPMF-Z is a compact body actuator integrated with internal guide shafts to isolate the load bearing from the movement of the actuator's rod and seals. The carbon steel alloy slide bearing provides lateral stability protecting it from side load impacts, suitable for stopping applications. It is available with a plate side flange. The MGPLF-Z is a compact body actuator integrated with internal guide shafts to isolate the load bearing from the movement of the actuator's rod and seals. The precision ball bushing allows for smooth operation that ensures stable travel resistance, suitable for pushing and lifting applications. It is available with a plate side flange. The MGPM/L-XC8 is an adjustable extend stroke type where the MGPM/L-XC9 allows for stroke adjustment on the retract stroke. The MGPM/L-XB13 is a compact body actuator integrated with internal guide shafts with the ability to operate smoothly at low speeds (5 to 50mm/s). Series MGP mounting options can help in tight mounting applications and still utilizes and ultra-compact design as the standard MGP. The MGPM-H/R is a compact body, end lock actuator integrated with internal guide shafts to isolate the load bearing from the movement of the actuator's rod and seals. The end lock can be specified for either the head end (H) or rod end (R) of the stroke. The brake spring, end lock mechanism will engage when air pressure is lost for drop prevention applications and can be released by reintroducing air pressure or via a manual release bolt. The (M) carbon steel alloy slide bearing provides lateral stability protecting it from side load impacts, suitable for stopping applications. The MGPL-H/R is a compact body, end lock actuator integrated with internal guide shafts to isolate the load bearing from the movement of the actuator's rod and seals. The end lock can be specified for either the head end (H) or rod end (R) of the stroke. The brake spring, end lock mechanism will engage when air pressure is lost for drop prevention applications and can be released by reintroducing air pressure or via a manual release bolt. The (L) high precision ball bushing allows for smooth operation that ensures stable travel resistance, suitable for pushing and lifting applications. 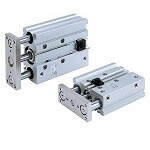 The MLGP-B/F is a compact body, locking actuator integrated with internal guide shafts to isolate the load bearing from the movement of the actuator's rod and seals. The locking mechanism can be specified for either the extension side (F) or the retraction side (B) of the stroke. The brake spring, locking mechanism will engage when air pressure is lost for drop prevention applications and can be released by reintroducing air pressure or via a manual process. The (L) high precision ball bushing allows for smooth operation that ensures stable travel resistance, suitable for pushing and lifting applications. The (M) carbon steel alloy slide bearing provides lateral stability protecting it from side load impacts, suitable for stopping applications.